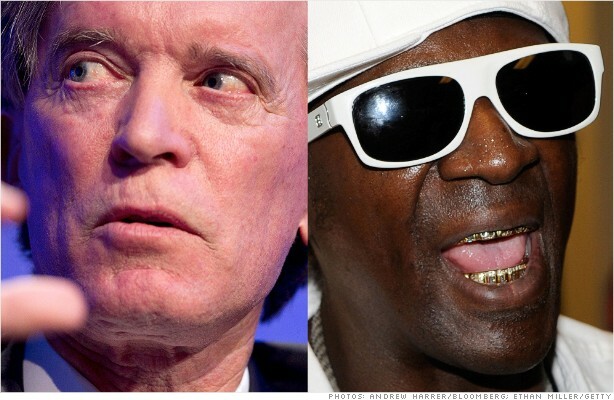 What do Federal Reserve chairman Ben Bernanke and Flavor Flav have in common? Yet, the 90s-era hype-man turned reality TV star, or at least his signature over-sized clock medallion, makes an unlikely appearance in Bill Gross's latest musings on Fed policy. In a Thursday letter to investors, the Pimco founder conjures up a Genie "with a 10-inch diameter Flavor Flav clock hanging ceremoniously around his neck," complete with sunglasses and gold teeth. In his latest missive, Gross, also known as the Bond King, imagines a conversation with the Flavor Flav Genie, who offers to predict the outcome of next week's presidential election. Gross dismisses the hypothetical offer, saying the outcome is meaningless and that voters are "merely election-day pawns" who are more interested in when the latest iPhone will be released. Gross expresses his disappointment in a "modern-day" Pledge of Allegiance to a "fragmented state of America" that, in a populist note, includes "liberty and justice for the 1(%)." The Genie responds by calling Gross old and "cranky." Gross, who's 68 years old, does not disagree. Once the political lament is done, Gross, who runs the Pimco Total Return Fund (PTTRX) moves on to his area of expertise: interest rates. He argues that the Fed's policy of driving down interest rates via quantitative easing is causing "financial repression" by punishing savers and encouraging spending that does not help the economy. "There is no evidence that investment is being incented by quantitative easing," says Gross. "All of the money being created and freed up is elevating asset prices, but those prices are not causing corporations to invest in future production." Gross acknowledges that Bernanke is "operating with one arm behind his back" as Congress remains locked in partisan paralysis. But he maintains that the Fed's policies have done nothing to revive the economy and that investors should beware. The combination of "bite-sized future returns" and "misguided monetary and fiscal policy" could lead to "disruptive financial markets," according to the letter. Gross also expects Treasury yields to remain low, saying the "cult" of equity, or expectation for total return in both stocks and bonds, is now over. "If growth cannot be boosted by monetary policy, and fiscal policy is in the hands of a plutocracy more concerned about immediate profits as opposed to long-term vitality, then no Genie or Flavor Flav with a magic clock can make a difference," says Gross.